We keep saying the same things about wildfires. When It Comes to Wildfires, How Many Times Can We Say the Same Things? Firefighters work to extinguish the Thomas fire in Ventura, California, on Thursday. Take two implacable forces. One sends dry winds surging down mountains like an avalanche over combustible brush. The other pushes houses and strip malls, the perimeter of an aggressive urban economy, against those same winds, mountains, and brush. Each time these forces clash, we see the same powerful call: We must halt future flames. Then another conflagration comes, indifferent to those responses, that yields another paramilitary surge in reply. But the fundamentals don’t change, so the fires and their damages don’t change. They only intensify. This year’s fires are nothing new. They only seem new to those with short memories. For most of the 20th century, they were called big fires or conflagrations, and they burned worse in the fall when the great winds blew. The 1977 season continued until New Year’s Eve, when the Honda Canyon Fire ripped through Vandenberg Air Force Base and killed four men, including the base commander and fire chief. Then, beginning in 1987 with lightning-kindled mass ignitions in Northern California, the outbreaks became fire sieges. The fire sieges have come with a rhythm: 1993, 2003, 2007, 2017. A 10-year interval seems enough to smother the horror with forgetfulness. 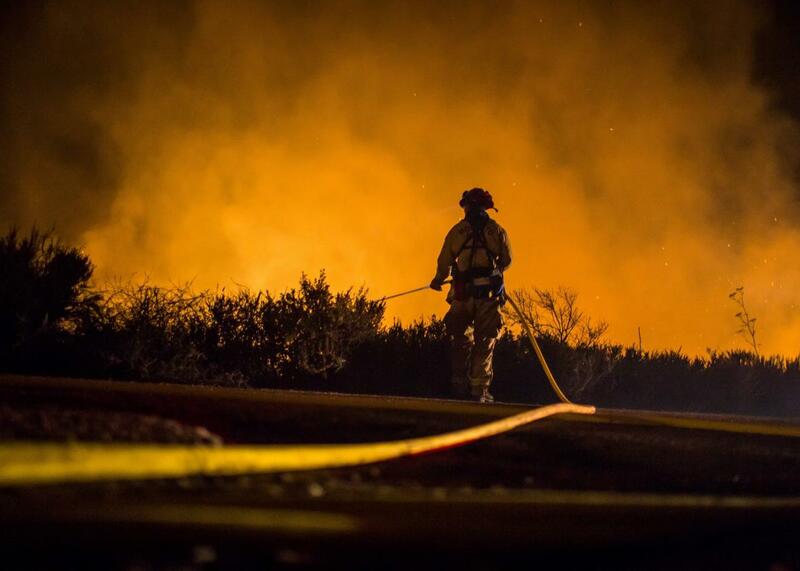 So long as the Diablo or Santa Ana winds flow, the fires are unstoppable. Worse, the winds can fan every stray spark into a potential eruption and can even kindle fires by causing power lines to fail. Bigger airtankers and more engines can’t halt the rush of flame or, more critically, the blizzard of embers that ignite fires far in advance of the flaming front. The fires can leap eight-lane freeways. The embers seek out every point of vulnerability. What can be done? It depends on how the problem is defined. The expression “wildland-urban interface” was first coined in Southern California to describe the problematic pyric border between city and country, the line in the brush where house and wildland met. As the concept spread (along with fires) to other parts of the United States, it referred to more of an intermix, where the built and natural environments often mingled promiscuously. The border represented two styles of fire protection, each as distinct as their fuels. Initially, the concept focused on protecting homes by addressing the wildland side. Yet the wildland side offers few options. Simple firefighting fails when the Santa Ana winds howl. That leaves modifying the vegetation—specifically, in Southern California, a shrub community commonly called chaparral—or introducing prescribed fire. But many of the treatments advocated elsewhere don’t apply or come at serious ecological costs, particularly when invasive grasses hover in the shadows waiting for a point of entry. Short of stripping every biological value from the land surrounding buildings or paving over every open space, the fires will still come. Even fire scientists, while agreeing on the basics, disagree over how to apply their knowledge. So it might better be considered from the urban side. We know how to use codes and zoning to reduce vulnerability in cities and harden the home ignition zone where sparks will meet structures. Besides, once such fires breach the city perimeter, they spread like urban, not wildland, conflagrations. Paradoxically, trees often survive better than houses. In the end, it’s a political decision, not a scientific question. We can’t really level the mountains or dam the winds. We seem unable to halt the push of urban sprawl. Not unlike mass shootings, we seem to be willing to accept the occasional if rising violence as a cost of how we live. It all merges into a numbing background noise. And what was once a California quirk is becoming a national norm. Such fires are spreading and the damages they inflict are worsening. They now range from Fort McMurray, Canada, to Gatlinburg, Tennessee. It’s tempting to lay much of the blame on climate change, which is disrupting and lengthening fire seasons. But global warming is only one expression of the deeper consequences of how a fossil-fuel civilization occupies landscapes and what can happen when those settings are, like California’s, prone to eruptive fire. It determines what kind of housing we prefer, how we site and arrange those houses, how we move goods and get to jobs. It shapes how we conceive and interact with our natural surroundings. (We even fight wildfire with pumps and planes that burn fossil fuel.) It determines what kind of power sources we promote and how we transmit energy to where we live. That powerlines have become a significant cause of ignition during extreme conditions is a dandy illustration of how the issues are structural and not easily corrected, and how they are only marginally under the control of the fire services. Deep reform will not come quickly: The lag in the existing system will continue at least for many decades. Even if the U.S. were to seriously tackle the problem of greenhouse gas emissions, those from the rest of the world would still affect the fire season. We need responses sooner. We may have to accept that, in places like Southern California, there is no rational solution,only temporary accommodations. Still, many small tweaks are possible. They are worth making. They won’t fix the problem—they certainly won’t make fire go away—but they can reduce damages. Future fires could then come like a bad blizzard or an annoying dust storm rather than a razing inferno. Instead of tightening the mainspring further, we can begin, bit by bit, to unwind it. Update, Dec. 7, 2017: Due to an editing error, this piece was originally published without its final two paragraphs.